A sick Palestinian girl cries in her father’s arms, unable to get medical assistance as she waits at a checkpoint station for hours in the hot sun. She is the face of the Palestinian-Israeli conflict, the reality of life in the West Bank, as depicted by director Chaim Yavin in the controversial and riveting documentary The Land of the Settlers: A Journey Log. “I cannot really do anything to relieve this misery other than to document it,” Yavin explains, “so that neither I nor those like me will be able to say that we saw nothing, heard nothing, knew nothing.” A respected newsman, Yavin made The Land of the Settlers with hopes of inspiring moral change in his countrymen. Over a period of two years, Yavin, who is referred to as Israel’s Walter Cronkite, traveled through Israel’s occupied territories with a handheld camera, documenting all that he saw. He interviewed Palestinians, checkpoint guards, leftist Israelis, and Israeli settlers in the West Bank, who all argue their beliefs adamantly and share stories of injustice and misery to back up their positions. Gripping and intensely emotional, Yavin’s documentary reveals the depths of the hatred on both sides, though the film ultimately questions whether Israel’s treatment of the Palestinians is fair or consistent with Jewish values. As an Israeli seeking to understand this conflict in which his fellow countrymen are engaged, Yavin takes an interestingly personal approach. Instead of speaking to politicians or political leaders, he invites himself into the homes of Palestinians and Israelis, where they explain their positions in their own kitchens over cups of coffee. As a result, the film puts faces and personalities on abstract political arguments. A controversial documentary, The Land of the Settlers has naturally met with mixed reviews. Some criticized Yavin for not being objective; others regretted that the film was not made sooner. Some applaud the film and others resent it, but no one can watch it without feeling moved. 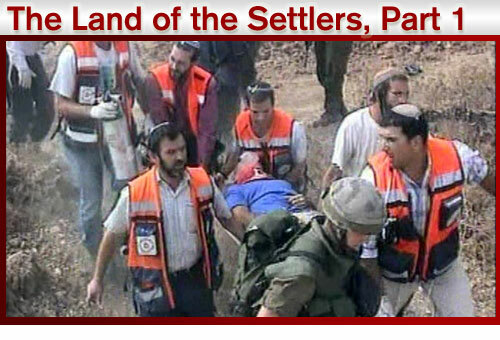 Ultimately, The Land of the Settler is a cry for humanity. The frustration felt on both sides is presented, despite the filmmaker’s self-critical view of Israel. Yavin shows gut-wrenching footage of the aftermath of a suicide bomb attack on an Israeli bus, and he also shows a Palestinian home that has been reduced to rubble. “I tell myself that bereavement is the same on both sides,” Yavin’s voice says from behind the camera, “except, in the evening news, they are always the murderers and we are always the victims.” In Yavin’s lens, the equation changes. The Land of the Settlers recognizes the difficulty of finding answers, but makes the question impossible to ignore.